The Marijuana Millionaire will show you how you and anyone in the States that allow it, can legally make an easy and fun $1Million Dollars a year within the first year or two, an amazing and historic opportunity! Read why you should get this book and read it today! Written from the prospective of the developing industry in 2009. The industry has evolved a lot since then. Read about the industry then in 2009 and compare it to what it is today in 2015! Read the Marijuana Millionaire and find out how this historic industry and opportunity is unfolding and how you can become a part of it. 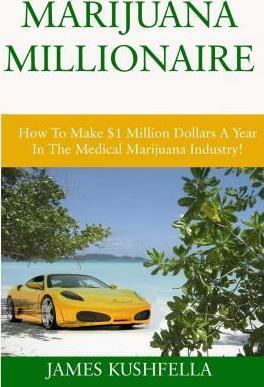 The 2015 update of the "Marijuana Millionaire" will be coming out soon this year! Now in 2015 industry has ballooned into an enormous industry with opportunities in all aspects of the business. Just like the gold rush, many business minded people are making money from the side businesses that support the cultivation and distribution of marijuana. Packaging, transporting, and branding are some of the many niche categories that can be seen that have sprouted up to support the industry. Marijuana related business are popping up everywhere to support the industry that has nothing to do with actually handling the marijuana itself. From 2009 to 2015 the industry has expanded at least by 20 times the amount of businesses out there catering to the developing marijuana industry! Read about it and see how you can figure into the industry by researching the many business out there. A simple internet search for "marijuana" will show you how big the industry is. According to many analyst, this is a Billion Dollar industry! Buy it today !